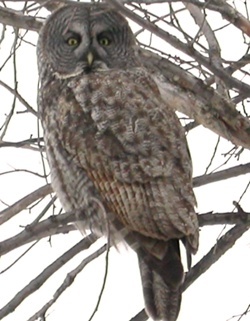 The Great Gray Owl is one of the world's largest owls, and the only member of its genus to be distributed across both North America and Eurasia. In North America, the breeding range spans most of the boreal forest, except for the east, with the known distribution tapering off in western Quebec. Although Great Gray Owls are thought to be largely resident, a few drift south every winter, and roughly every four years a major movement is observed. MRF is interested in tracking the movements of some of the owls that reach southern Quebec and Ontario, in an effort to draw better linkages between wintering and breeding areas. Great Gray Owl roosting in a tree near on Ile Bizard, Quebec.